Transparency Market Research provides key insights on the first aid kit packaging market in its published report, “First Aid Kit Packaging Market: Global Industry Analysis, 2013 – 2018 & Opportunity Assessment, 2019 – 2027.” In terms of market value, the global first aid kit packaging market is estimated to expand at a CAGR of 4.0% over the forecast period, owing to numerous factors, about which TMR delivers thorough insights and forecasts in this report. First aid kit packaging is used as a unitizing container for first aid accessories or supplies which are necessary during medical emergencies that occur at workplaces, while travelling, or during sporting. First aid kit packaging is made up of plastic, metal, glass, or fabric (cotton). First aid kit packaging finds applications in various industries such as building and construction, offices, military services, automotive, sports and adventures, household, and manufacturing industries. First aid kit packaging is designed on the basis of portability and mounting requirements. The global market for first aid kit packaging has been segmented on the basis of material, product, packaging type, and end-user base. The demand for first aid kit packaging increases due to the need for different packaging formats at economic costs. Country-wise regulations and compliance standards are acting as drivers in material-level and product-level developments in the first aid kit packaging market. This report evaluates the trends that are fueling the growth of each market segment on the worldwide level and provides potential takeaways that are beneficial for potential market entrants in the first aid kit packaging market. The North American first aid kit packaging market includes a country-level analysis for the United States and Canada. Canada is projected to witness a sluggish growth rate as compared to the United States first aid kit packaging market. The automotive industry is anticipated to be the largest consumer of first aid kit packaging owing to stringent compliance from government authorities. The Latin America first aid kit packaging market includes a country-level analysis for Brazil, Mexico, and rest of Latin America. Brazil is estimated to account for almost half of the first aid kit packaging market in Latin America. The European first aid kit packaging market includes a country-level analysis for the United Kingdom, Germany, France, Italy, Spain, and Rest of Europe. Germany is expected to be the largest consumer in the European first aid kit packaging market due to workplace compliance regulations. The online sale of first aid kits is attributed to fuel the United Kingdom first aid kit packaging market. 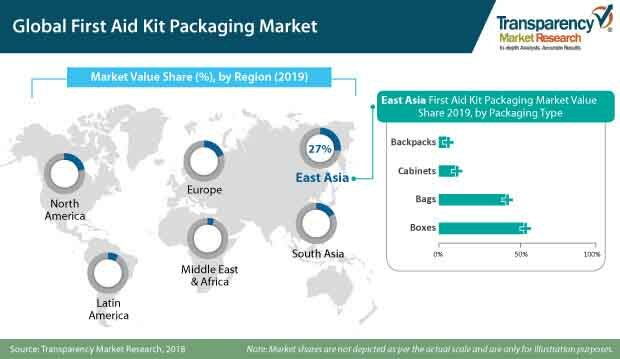 The South Asia first aid kit packaging market includes a country-level analysis for India, Thailand, Malaysia, Indonesia, Oceania, and Rest of South Asia. In South Asia first aid kit packaging market, India is projected to represent a lucrative market opportunity throughout the forecast period. The East Asia first aid kit packaging market includes Japan, China, and South Korea. China is projected to witness fast-paced growth during the forecast period. The Middle East and Africa (MEA) first aid kit packaging market includes a country-level analysis for GCC Countries, South Africa, North Africa, Turkey, and Rest of MEA. The South Africa first aid kit packaging market is estimated to be the largest country-level market in the Middle East & Africa. In the first aid kit packaging market report, we have deliberated specific strategies followed by key players in terms of enhancing their product portfolio, creating new marketing techniques, products, and business development. The ‘Competitive Landscape’ is included to provide report audiences with a dashboard view and company share in the global first aid kit packaging market. The key intensity mapping is provided in the first aid kit packaging market report to elaborate the geographical presence of profiled companies. Crownhill Packaging, A2B Plastics Ltd., Acme United Corporation (First Aid Only Inc.), Certified Safety Manufacturing Inc., Cintas Corporation, Crest Medical Ltd, Fieldtex Products Inc., First Aid Supplies Pte Ltd., GAGGIONE, Honeywell Industrial Safety USA Inc., Lifeline First Aid LLC, Masune First Aid, Inc., Medline Industries Inc., Reliance Medical Ltd., SYSPAL Ltd., and The Durham Manufacturing Company.